The Rebar Reference mobile app is available in the Apple App Store and Google Play Store for iOS and Android devices. 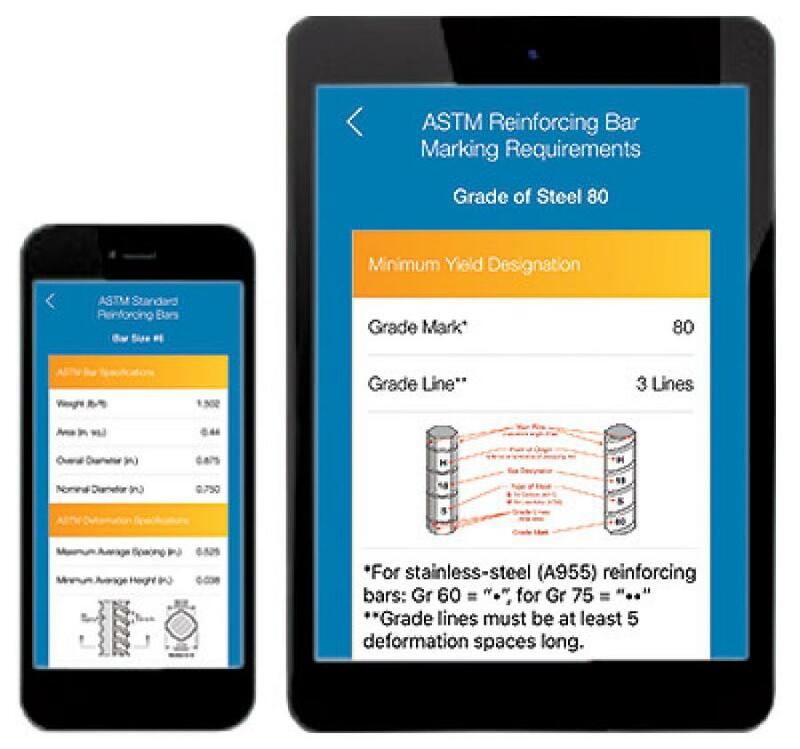 The Concrete Reinforcing Steel Institute (CRSI) announced the release of the Rebar Reference mobile app, which has been designed for use as a ready reference guide for common reinforcing steel data and information. ASTM standard rebar specifications are provided including sizes, diameters, areas and weights along with typical hook details. Minimum yield and minimum tensile requirements per ASTM also are included. Industry standard bar markings for inch-pound rebar is illustrated for grades 40, 50, 60, 75, 80, 100 (A615), 100 (A1035), and 120. Links to the Concrete Reinforcing Steel Institute's online offerings (Resource Materials, Rebar U, CRSI website) also are incorporated. "We are excited to launch the Rebar Reference app as a step toward engaging our industry in new and dynamic ways," said Danielle Kleinhans, president and CEO of CRSI. "It's one of the methods we are utilizing to make our resources more accessible and useful." Future releases will include steel mill bar marks and sizes, and a field inspection module including information on concrete cover, types of ties, tolerances and lap splices. The app is available in the Apple App Store and Google Play Store for iOS and Android devices. Founded in 1924, the Concrete Reinforcing Steel Institute (CRSI) is a technical institute and Standards Developing Organization (SDO) that stands as the authoritative resource for steel reinforced concrete construction. Among the Nation's oldest trade associations, CRSI offers many industry-trusted technical publications, standards documents, design aids, reference materials and educational opportunities. CRSI's members represent more than 80 percent of the U.S. manufacturers, fabricators and placers of steel reinforcing bar and related products with more than 600 locations in 49 states, and with more than 15,000 employees. Members produce, fabricate and install approximately 9 million ton of reinforcing steel per year using scrap steel in efficient manufacturing operations. It is estimated that the industry impacts more than 75,000 people in steel transportation and placement in North America. The CRSI membership also includes professionals across the country who are involved in the research, design, and construction of steel reinforced concrete. CRSI staff comprises a nationwide region network of industry professionals. For more information, visit www.crsi.org.